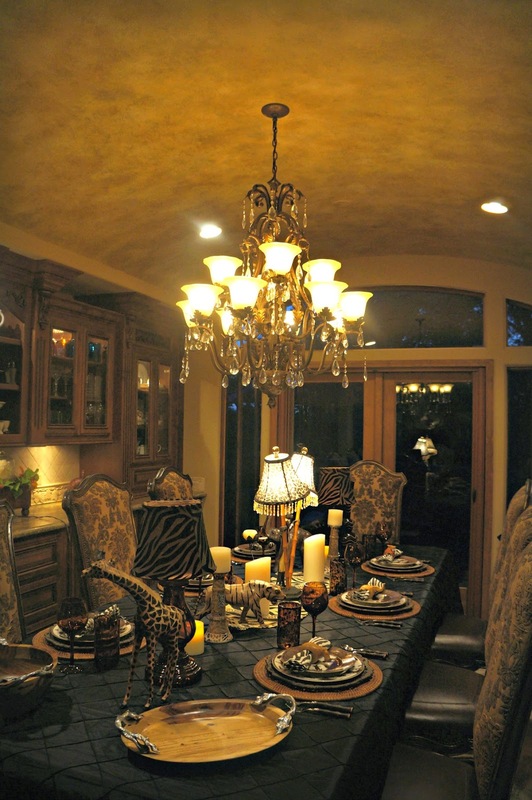 We had a dinner party the other night and we thought it would be fun to have an exotic animal dinner party. Lions, and tigers, and bears! Oh, my! Liz from Infuse With Liz, do you remember sending me these leopard print curtains? I used them for the center of the table,along with our cool monkey lamp. I love this adorable monkey candle holder. Most of these items I had already. We both went into Pier1 and ended up browsing around. 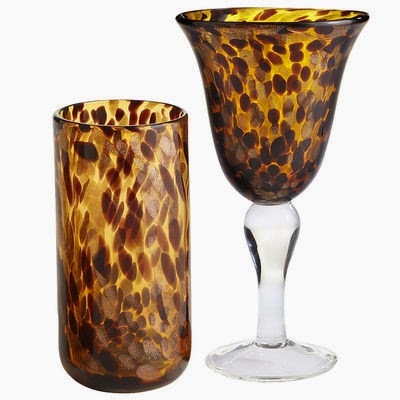 My husband found the leopard print glasses, cocktail shaker and the gorgeous wooden bowl and platter. 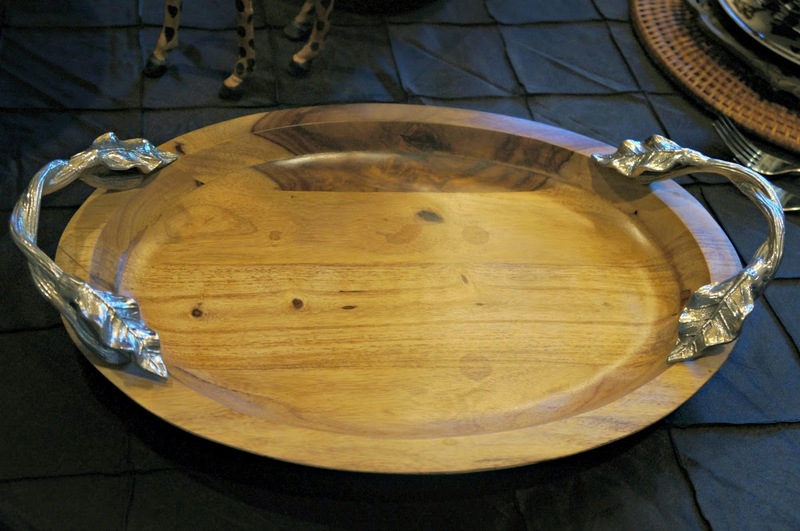 Hawthorn Wood bowl and platter from Pier1. I happened to have the grape leaves salad server, which matches perfectly. The salad plates are different. Elephants, lions, giraffes, and rhinos. Come join us. Pull up a chair.... Happy weekend everyone. I have to share this beautiful painting Jax Frey sent me as a thank you for designing her blog. Thanks again Ron from Uptown Acorn for referring Jax to me. What a fabulous table setting. Love all of your Pier 1 finds as well. Love it all!!! Oh, to be a guest at one of your dinner parties!!! I hope they know how SPECIAL it is!! Z Gallerie plates! I should have known!!! That place....I love it! They truly have some of the most intriguing dish patterns ever. Every time I walk in that store, I want to buy a dozen of everything!!! Your Pier 1 and Horchow glasses look terrific with the dishes. You have some really terrific decorative items that fit so well with this theme, especially that monkey lamp and candle holder! Very exotic but still lots of fun! The napkins and napkin rings are perfect for the setting, too! Umm I love this! I thought the centerpiece fabric looked familiar- glad you found a way to use them! I love that monkey lamp- what a perfect design element! Those dishes are fabulous and so are the Pier 1 glassware pieces! You pulled together a really first class designer table! Take hubby along more often- it's so much more fun to buy goodies like that when they enjoy it too! What a fabulous theme that you pulled off wonderfully! Great tablescape, Linda! YOWSA!!!!!!!!!!!!!! This is absolutely WILD, LINDA! That is SO COOL, Linda! 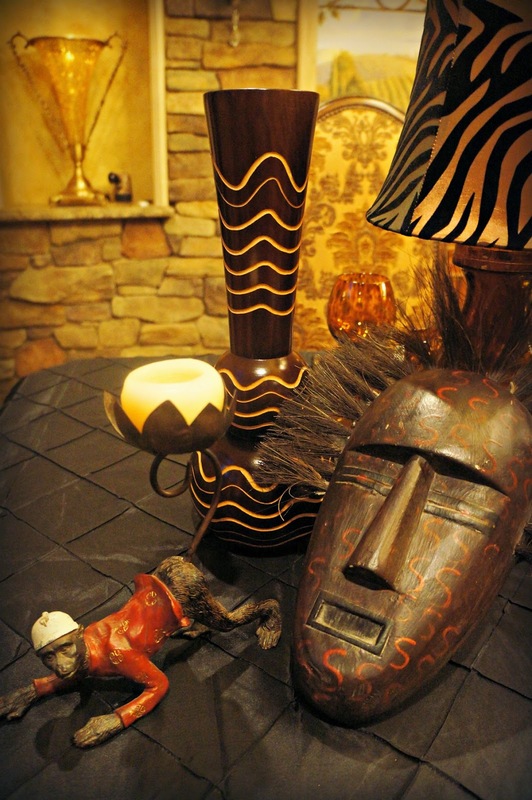 I feel like I've been on a safari...really, really neat items & so beautifully arranged. 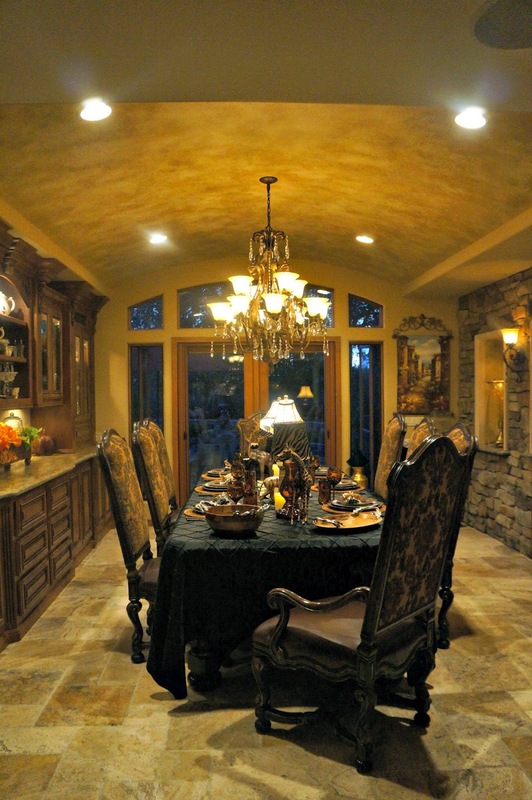 I adore your dining room...I think it is my favorite room in your lovely home. I'm glad you're doing so well & able to entertain & enjoy it. Hi Linda, love this table setting. 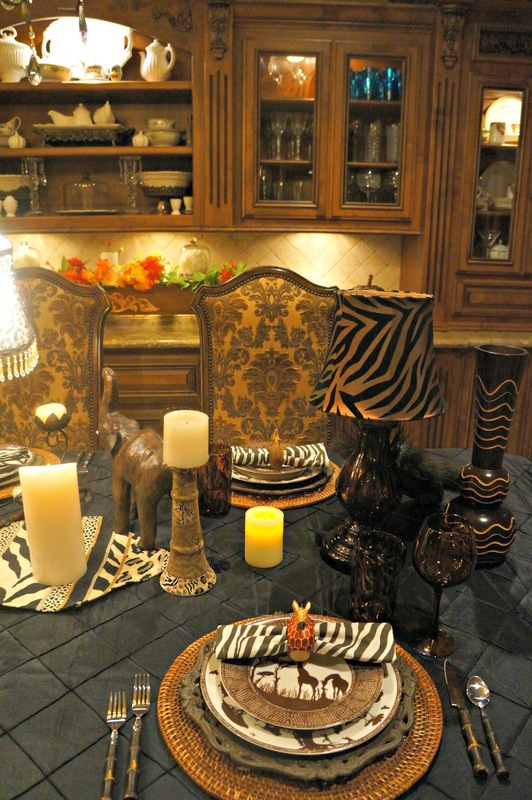 Everything is perfect for a wild kingdom dinner. I always think a great table theme makes the food taste better. 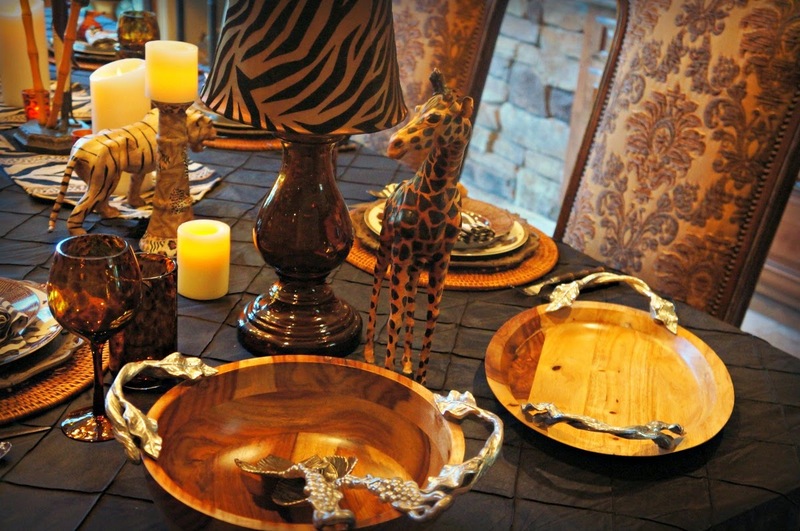 Gorgeous Pier One pieces. 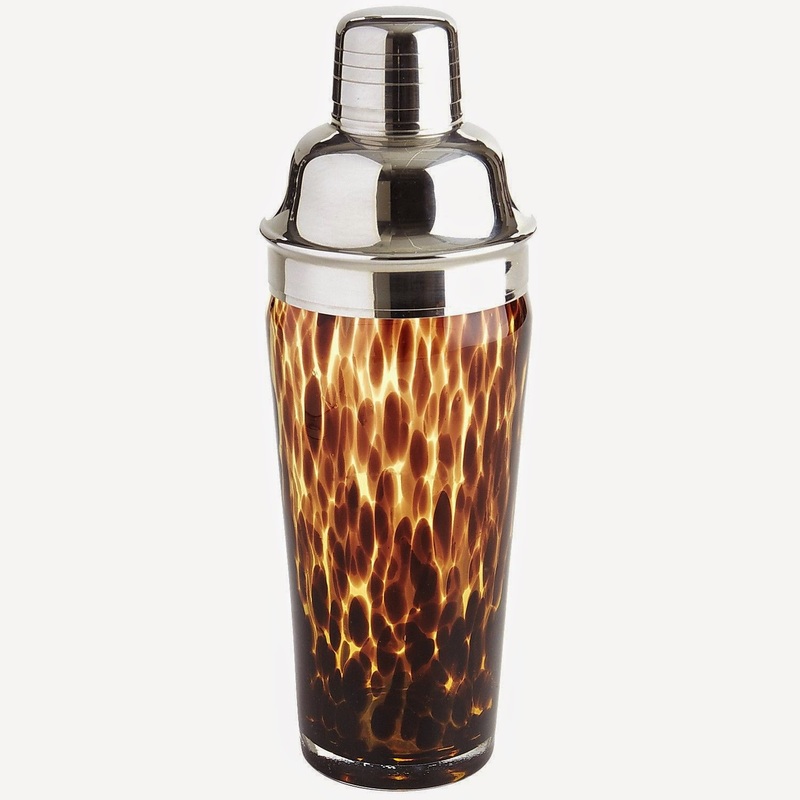 They are perfect with your table. Great lamp centerpiece. Thanks for sharing the ideas. Stunning! 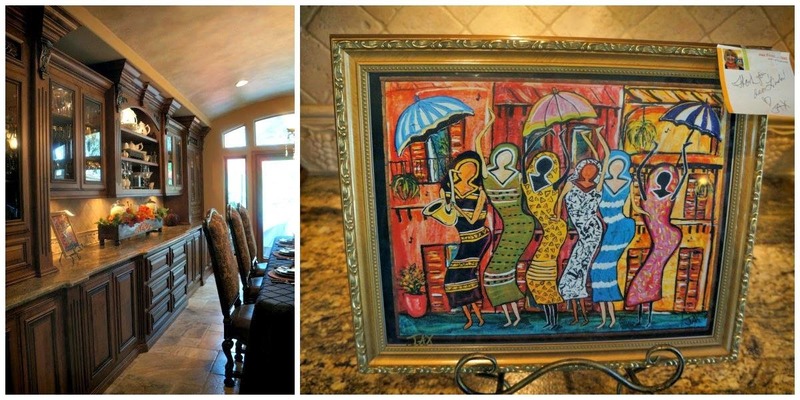 I hope you had some Ladysmith Black Mambazo music playing in the background to accompany your African feast! Or at least, "The Lion Sleeps Tonight," LOL! As soon as your guest saw that table, I'm sure they knew it was going to be a fun night! Between your fun table and tasty menu, I would bet is was a great time! Thanks for sharing Best of the Nest! 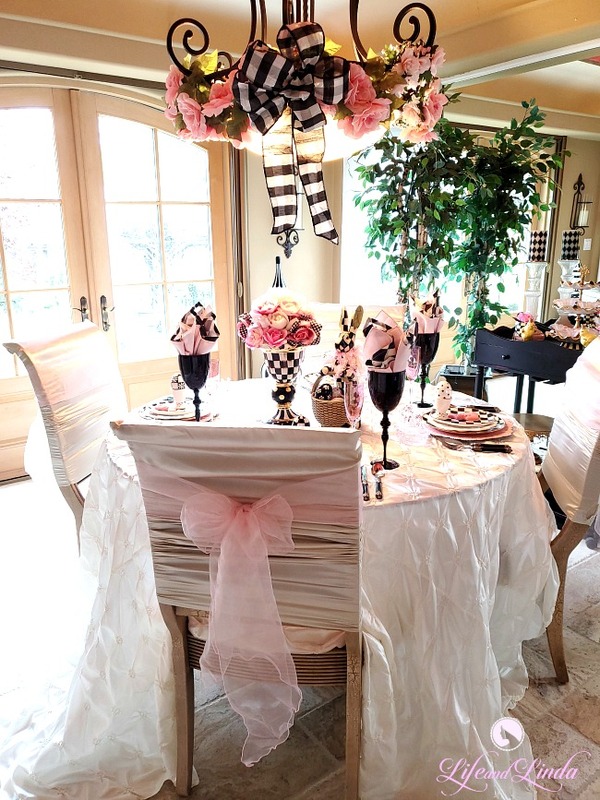 Your table setting looks gorgeous, it so much fun to make it look wonderful and unusual. I love Pier 1 so much I wanna marry it. 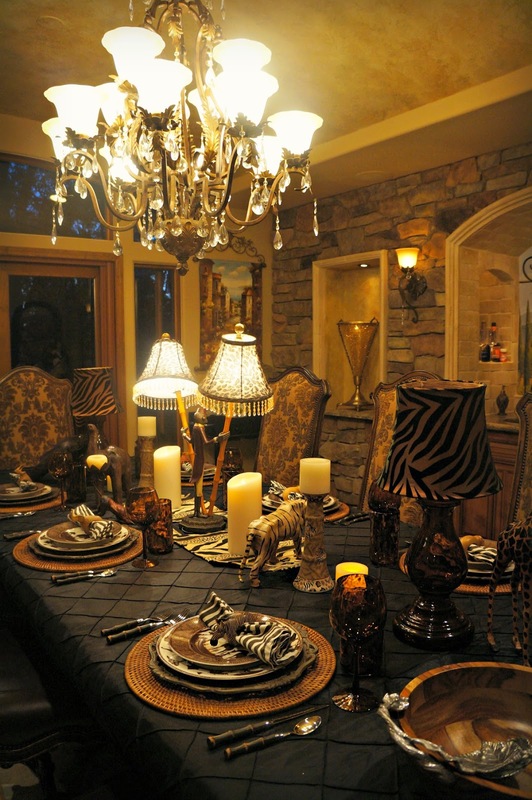 You always have the most amazing tablescapes! You know, we used to have a Pier 1 by the mall. I haven't been there in years though, so I'm wondering if it's still there. I'll have to check and see. Amazing and bet the meal was divine . . .
Wow, what a table, Linda! Your guests certainly must've enjoyed the wonderful setting and the fabulous menu. I don't receive your posts emailed to me any more, along with so many others. Do you know how to resolve that issue? and I love it........Your menu sounds delectable too. 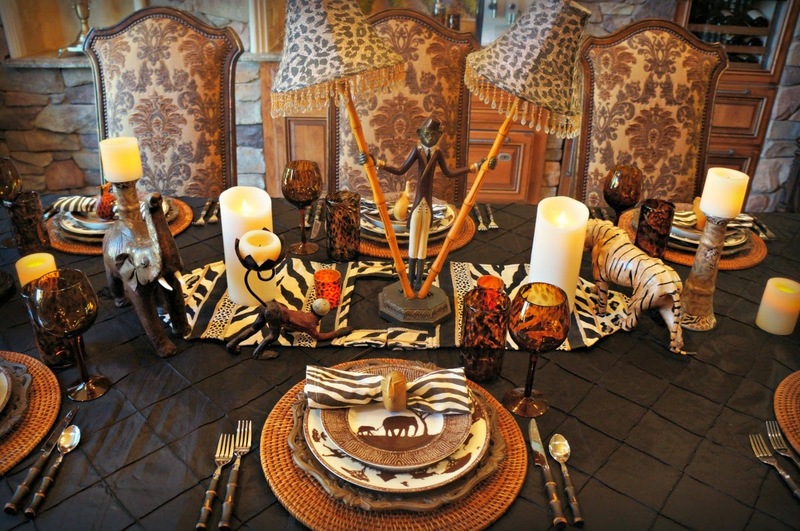 I would feel like I was on safari sitting at this cool table. Thanks for sharing it with us. I have the same glasses, Linda but MY hubby got them at a gift shop at a nursery!!!! I love, Love them! The plates are gorgeous too. Do the 2 lamps on the end light? Love the leopard shades! The whole table is ME!!!! The menu sounds delicios as well. The painting is gorgeous!!! Gorgeous! 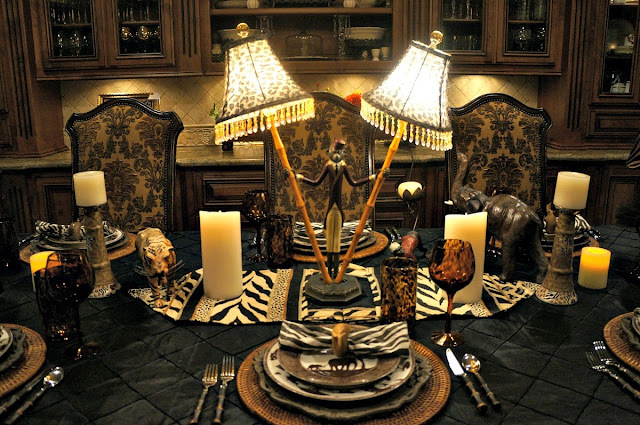 I love animal theme everything, you have captured the elegant exotic with this fabulous table! oh, and I LOVE your new painting! Hi Linda! OH, this is an amazing table. Love your theme and every accessory you've used is just perfect! The menu sounds great too. I'm sure your guests were thrilled with all of the attention you gave them! The painting is so fabulous! Hope you're doing well. Wow, that is really spectacular! Looks like SO MUCH FUN! Pier 1 is a dangerous store for me, way too much temptation. The clearance section is my first stop and I usually find something to tempt me. 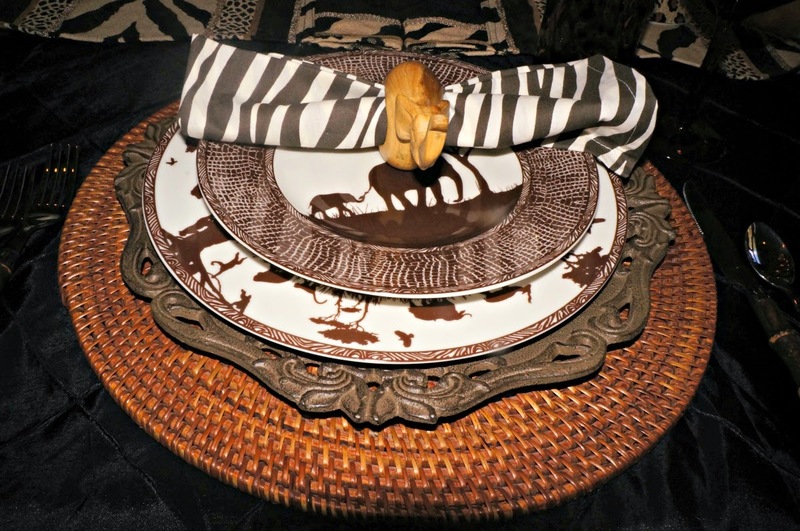 My daughter-in-law gifted me with some beautiful items when she came back from Tanzania and your table is gorgeous gives me lots of ideas. This is such a cool looking table Linda! 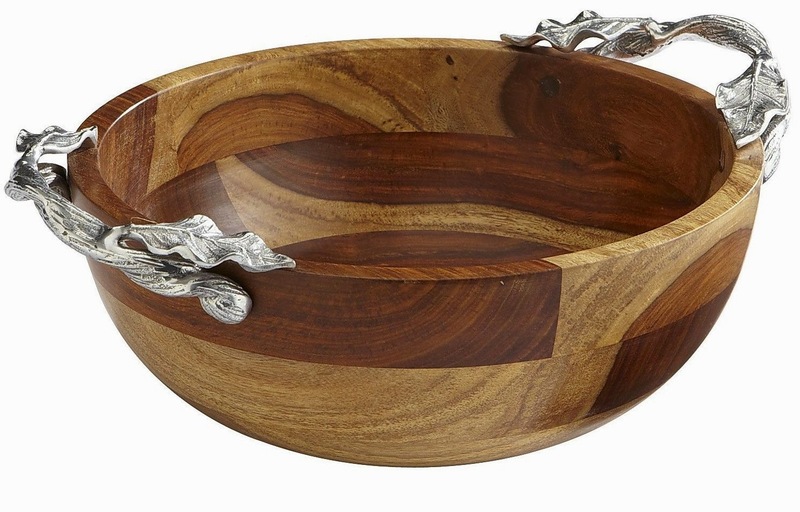 I love those bowls, I want those wooden bowls lol. My favourite thing is that lamp as the centerpiece. Everything looks amaizing.